You see the store doesn’t have their own website. 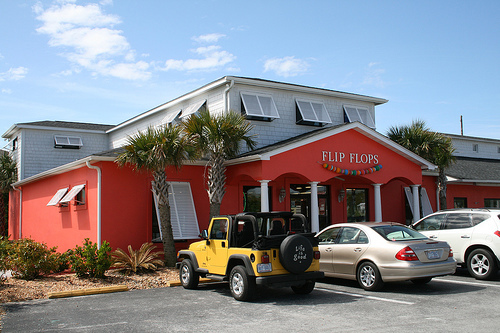 I’ve actually told Marcie (the REAL owner of Flip Flops) that she needs a website and that she is missing opportunities for sales over the web. I can only do so much. So the next time you drop in to that funky little beach shop attached to the convenient store on your way from Emerald Isle to Indian Beach, please tell Marcie that the guy at the Crystal Coast Blog said he is still getting emails from people saying they want to purchase another one of those cute little “fuzzy-bottomed coozies” or order more of those stickers you have on your counter. We Love Our Crystal Coast Blog Visitors! Don’t get me wrong, Pam and I love the fact that people are coming to our Crystal Coast Blog and we will continue to highlight our favorite things to do, awesome places to eat and unique shops to checkout here on the Crystal Coast. So if you want to leave a message for Marcie, the owner of Flip Flops, always feel free to leave a comment. I go in Flip Flops most every year that we’re down there and I have also mentioned this fact to them ~ that they need a website! However, it keeps us coming back year after year! But it would be so nice to be able to order some the unique things they have in their store for Christmas/Birthday gifts, etc!